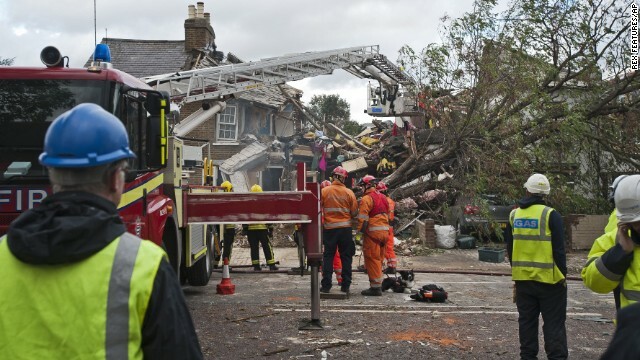 Emergency crews in London clear the wreckage of a house after a fallen tree caused a gas explosion there Monday, October 28. 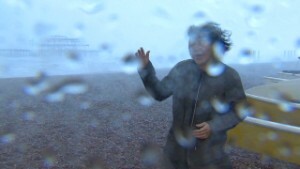 A major Atlantic storm brought wind gusts close to 100 mph Monday, knocking out power to thousands and disrupting travel in England, France, Belgium and the Netherlands. 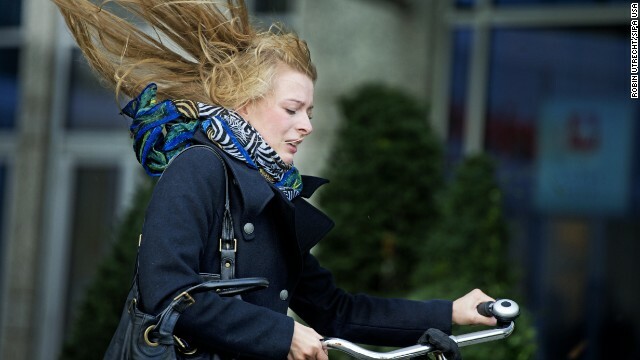 Strong winds from the storm hit Scheveningen, Netherlands, on Monday. 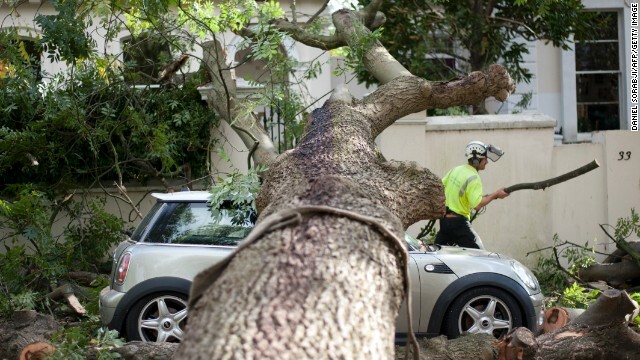 A contractor works on clearing the debris after a tree fell on car in London on Monday. Large waves break against the harbor wall in Dover, England, on Monday. 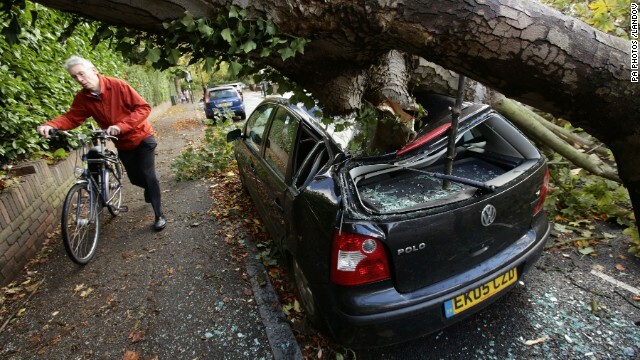 A car in London is crushed by a fallen tree on Monday. There have been several reports of people being killed by fallen trees. 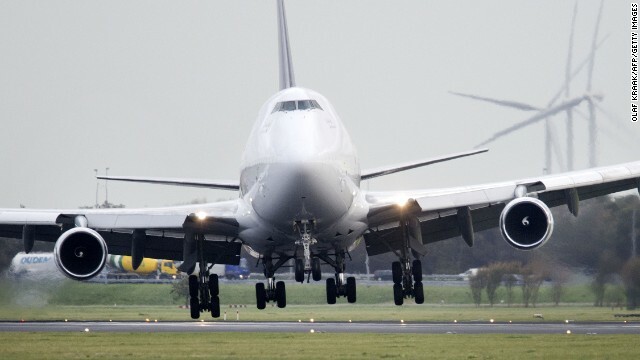 A plane lands with a tilted angle Monday on the runway of Amsterdam Schiphol Airport. Electric company workers cut tree branches and repair power lines Monday in La Roche-Maurice, France. Officials said early Monday that 42,000 homes in northern France were without electricity. 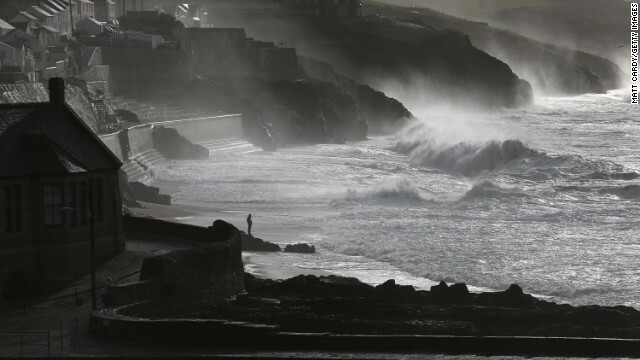 Large waves break along the coast in Porthleven, England, on Monday. 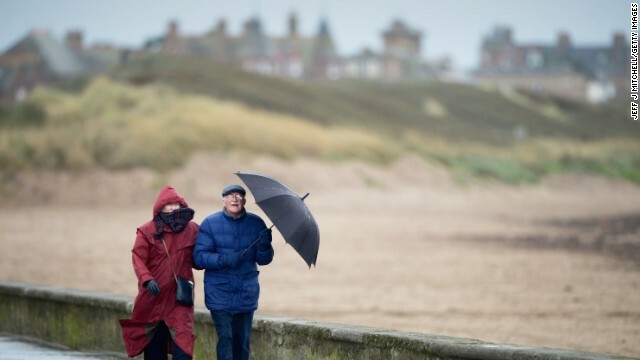 People walk along the Troon South beach in Troon, Scotland, on Monday. A fallen tree lies on a London road Monday. Weather forecasters had said before the storm arrived that it could be the region's worst in a decade. 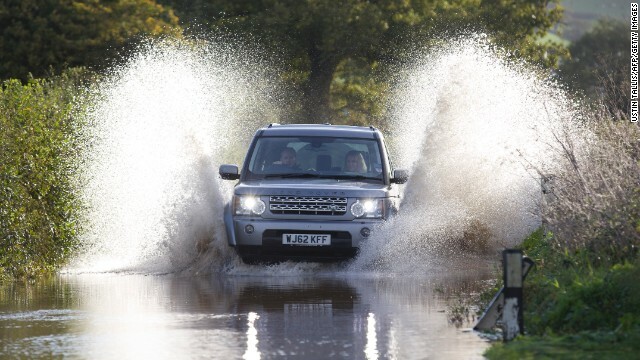 A vehicle splashes through a flooded section of road near the English village of Whitford on Monday. 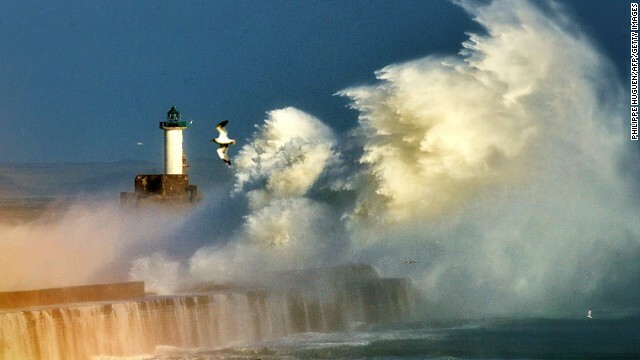 Large waves break against the dyke Monday at the port of Boulogne, France. 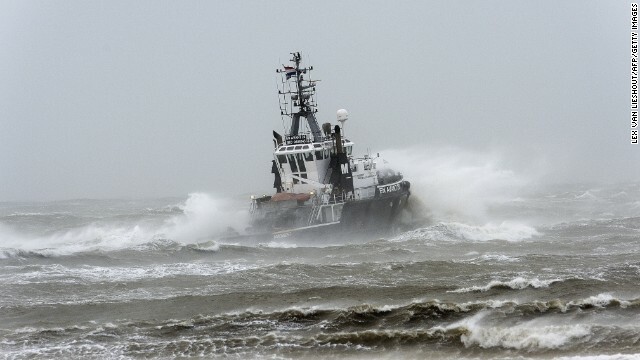 A boat in Scheveningen, Netherlands, is caught in the strong winds Monday. Father and son play on the beach in Brighton, England, on Sunday. 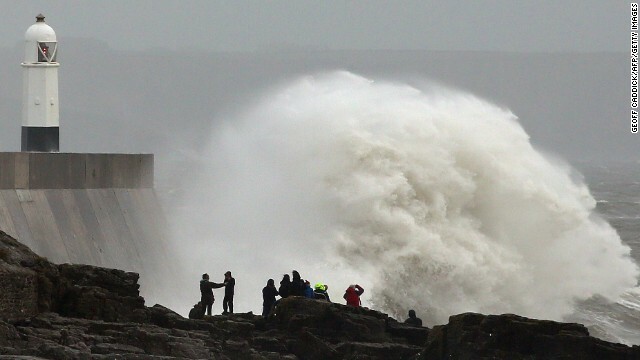 People stand on the rocks as large waves break against the harbor in Porthcawl, Wales, on Sunday. Are you affected by the storm? Send photos or videos, but please stay safe. 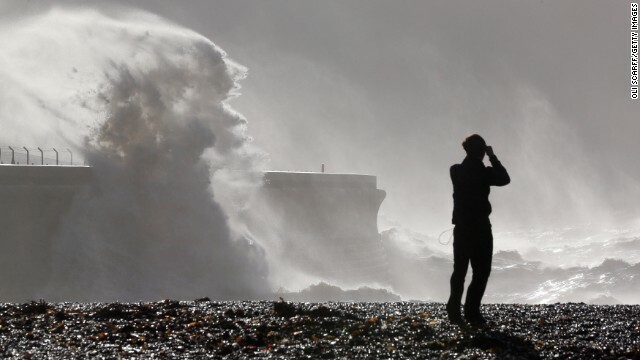 (CNN) -- A major Atlantic storm packing hurricane-force winds pummeled England, France, Belgium and the Netherlands early Monday, knocking out power to 220,000 homes in England and blocking roads and railways with fallen trees. At least nine people were killed. Wind gusts as strong as 99 mph battered the south coast of England, and authorities warned of travel disruptions across the region. At least two storm-releated deaths were confirmed in England, and a third person was reported missing. Police in Kent said a 17-year-old girl was killed Monday morning when a tree fell on the home where she was sleeping in Hever, south of London. A man in his 50s was killed when a tree fell on a vehicle Monday in Watford, northwest of London, according to Hertfordshire police. In Germany, five people were killed, four of them by fallen trees. A woman in the city of Heiligenhafen was killed when a wall supporting a terrace fell on her. A tourist was killed by a falling tree in Amsterdam, police said. And in France, the body of a woman was found on a beach near Belle-Ile. Witnesses said the woman was swept away by a wave. As the storm approached, rescuers had to suspend their search for a missing teenager believed to have been swept out to sea. The unidentified teenager disappeared from Newhaven, East Sussex, on the southern coast, according to the Royal National Lifeboat Institution. Authorities were checking whether two other deaths were related to the storm. A man and a woman died -- and a third person was hospitalized -- as a result of a gas explosion at a house in Hounslow in West London, London's Metropolitan Police said. Investigators were checking whether a tree that had fallen in the area damaged gas pipes and caused the blast. The storm also affected France, Belgium and the Netherlands. A woman was killed by a falling tree in Amsterdam, local media reported. 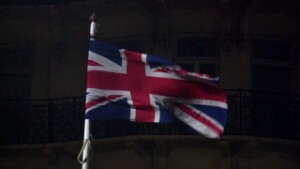 Officials said 42,000 homes in northern France were without electricity. 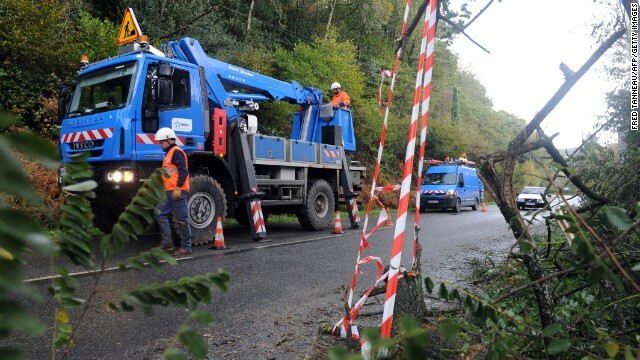 Overnight, the number of homes in France without power peaked at 75,000. The strongest wind gusts in England -- 99 mph -- were recorded on the Isle of Wight, which is off the southern coast, the Met Office said. The storm cut power to people across the southern part of England. The Energy Networks Association, which represents British and Irish power operators, said that 220,000 homes were without power in the southeast, southwest and midlands of England. Energy companies said they were working to restore power as quickly as possible. Authorities warned that the heavy rain from the storm could cause flooding in some areas. Eighteen flood warnings were in place in southwest England, the government said. 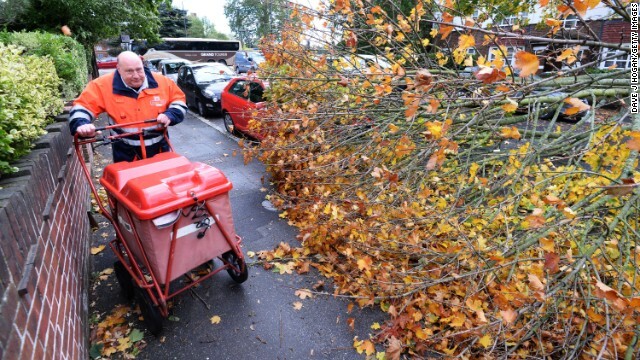 In the southeast, Sussex Police said they had had reports of more than 125 trees down across the county. They warned drivers to be careful, especially on smaller roads. Network Rail, which manages Britain's rail infrastructure, said more than 100 trees were on rails in the network across the southeast. Heathrow Airport said it was reducing the number of flights Monday because of the severe weather. But they said they didn't expect the conditions to be as severe as those during the "Great Storm" of 1987, which was responsible for the deaths of 18 people in Britain and four in France. 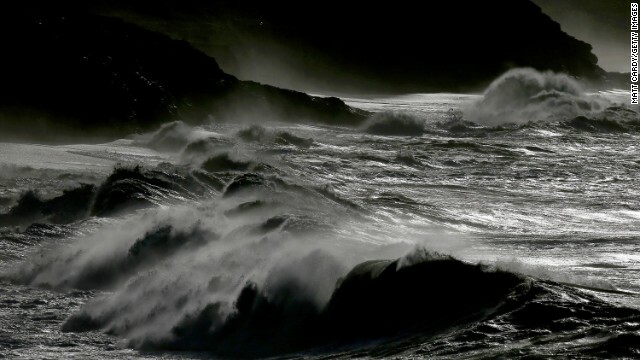 In 1990, the "Burns Day Storm" left a trail of destruction from the Isles of Scilly to Denmark, killing 100 people, including 47 in the British Isles, according to the Met Office. CNN's Joseph Netto, Dana Ford and Erin McLaughlin contributed to this report.